Our new WebBased Remote Unlock Platform has just gone online! Through this service you can directly request unlock codes for selected models from Alcatel, Blackberry, Huawei, Zte, and many more models. 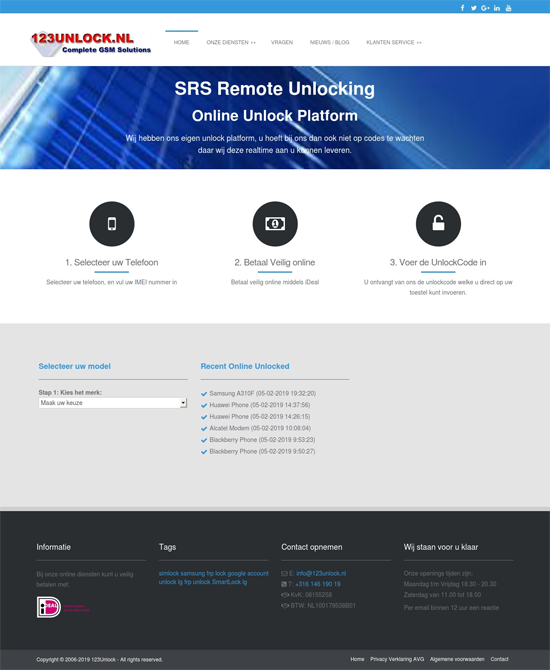 The system has background comminucation with our SRS Service, so you can immediately see if the unlock code is available. Because we do not need to perform manual actions, the service is available 24/7 and we can offer this service for only 10 euros per phone. The Remote Unlock Platform will be expanded with several new models in the near future. With great pride we present you our new website! With this site we would like to show you who we are, and give you more insight into our services. If you have any ideas or comments, please let us know, send us an e-mail or use our Contact form.